The Book of Psalms is a book of poetry, which was used as the “prayer” of “service” book in the ancient Israelite Temple. Composed of 150 poems, Rev. Eugene Peterson writes that, they form are a “prayer book that gives us a language adequate for responding to the God who speaks to us.” They can teach us how to pray. Psalm 40 is a prayer of both thanksgiving and lament. It’s unusual as most lament psalms begin with the complaint followed by thanksgiving. But here in Psalm 40 thanksgiving and its outcome (vv. 1-10) precede the complaint against God and petition for divine help (vv. 11-17). The initial thanksgiving is for some past, unspecified lament. It serves as a foundation for a further complaint revealing that the way of faith does not just flow in one direction – lament to thanksgiving. The waiting of the psalmist, and that waiting which we often know in life, is not always smooth, easy or ‘patient’. It has its own ups and downs, its own reversals. And yet….God brings us from the pit, puts our feet on solid ground and gives us a new song to sing. The psalmist poet seems to have been delivered from the very real threat of death, presumably from a disease or illness. And now – independently, or maybe it’s related – the poet is surrounded by evils portrayed as wild dogs and animals circling for the kill. How does this psalm speak to the rhythms of life and faith that we have experienced or are walking through now? How does it portray the places in which we know pain and joy, hope and despair, trusting in God in both doubt and in faith. How might this psalm provide us with the language we need to pray and live from a place of faith, whether we are in the pit, or standing on solid ground? Look at the link between remembering God’s deliverance and telling others about it? What is the intersection between personal faith and communal worship? How have you experienced that in your own life? How do these metaphors give you the language to talk of faith – both your gratitude and your “complaints” against God or prayers for action and help? When have you heard this psalm before? What do you think the Psalm is saying? ¥ How / when have you felt trapped in a pit? How have you experienced “waiting” for God in your own life? When? How did it happen, and/or end up? What does psalm 139 say to you about your own difficulties, and the hard times you go through?¥ How does this psalm feed your soul? How has God put a new song in your heart? How has God moved you from thanksgiving for God’s deliverance and help to a paying-it-forward proclamation of God’s goodness? Share your story of deliverance and complaint (or petition of God) with someone else. How do you react to your story as you re-tell it aloud to someone else? 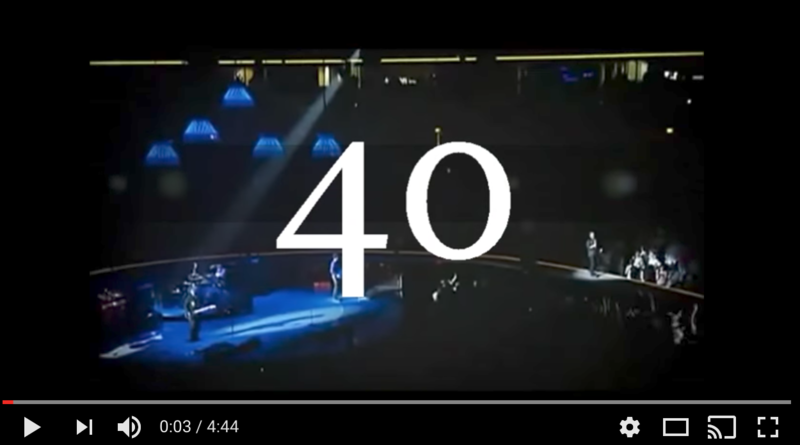 Here’s a video link to the song “40” – a take on the psalm – by the band U2. Listen to the song as you reflect and/or pray through the Psalm. Click on the image to start the video on youtube.